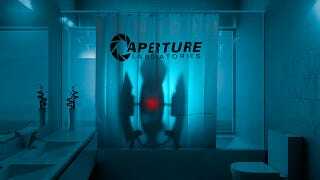 Portal's Aperture Science got its start in 1953 producing shower curtains for the US Army. So it's poignant that in 2011 the company goes back to its roots, and produces shower curtains for...your bathroom. These curtains don't talk, don't sing and don't flash lights. They're just curtains. Good, honest curtains. The kind of curtains Cave Johnson would sell to the Army. Only without all the mercury*. They cost $20, and you can grab one from the link below. *WARNING: They may contain less than 1% mercury.